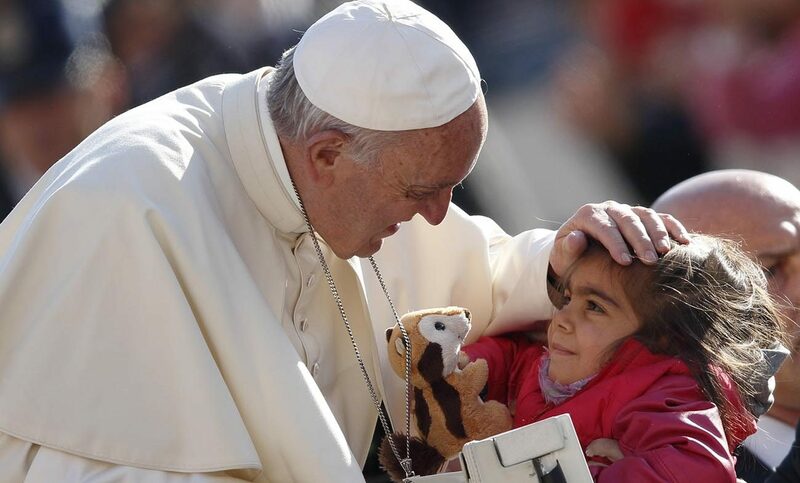 VATICAN CITY (CNS) — While donation campaigns and charitable contributions for the needy are important, true Christian charity involves a more personal touch, Pope Francis said. Coming face to face with the poor may pose a challenge and tempt people to turn the other way and give in to “the habit of fleeing from needy people and not approach them or disguise a bit the reality of the needy,” the pope said Oct. 19 during his general audience in St. Peter’s Square. “Poverty in the abstract does not challenge us. It may make us think, it may make us complain, but when you see poverty in the flesh of a man, a woman or a child; this (certainly) challenges us!” he said. The square was packed with thousands of people, many of whom attended the Oct. 16 canonization Mass of seven new saints. Among the pilgrims was a group from the pope’s native Argentina who sang folk music and dressed in traditional ponchos. After his address, the pope greeted the group and blessed a life-sized statue of newly canonized saint, St. Jose Gabriel del Rosario Brochero. The statute depicted the “gaucho priest” seated on his mule, his means of transportation when traveling thousands of miles to minister to the poor and the sick. When a poor person “knocks on the door of our house, it is very different because we are no longer facing an image but are personally involved,” he explained. “In these instances, what is my reaction? Do I turn away? Do I move on? Or do I stop to talk and take an interest? If you do this, there will always be someone who says, ‘This one is crazy, talking to a poor person,'” the pope said. Recalling St. James’ affirmation that “faith without works is dead,” Pope Francis said that Christians cannot “delegate” feeding the hungry to others and helping the needy through words and deeds. “It tells us that the little that we have, if we entrust it to Jesus’ hands and share it with faith, can turn into an overabundant wealth,” the pope said. Citing Pope Benedict XVI’s encyclical “Caritas in Veritate” (“Charity in Truth”), the pope said that feeding the hungry is “an ethical imperative for the universal church” and a calling for all Christians to defend the universal right to food and water, especially for the poor and the needy. “Our relationship with God — a God who, through Jesus, has revealed his merciful face — involves our giving food to the hungry and giving drink to the thirsty,” Pope Francis said.